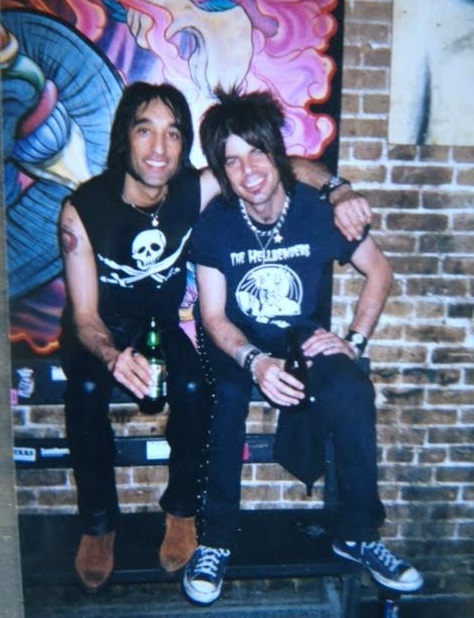 ROCK-N-ROLL KAMIKAZES: Me and Steve at Emo’s in Austin during one of the The Dragons’ annual SXSW appearances. Steve’s smile and style were the envy of all who met him. My fondest memory of Steve Rodriguez is watching him step out of a van in the parking lot of Curra’s Grill in Austin, Texas. I was there to interview his band The Dragons for Metal Edge magazine (an odd fit, but I pushed hard). 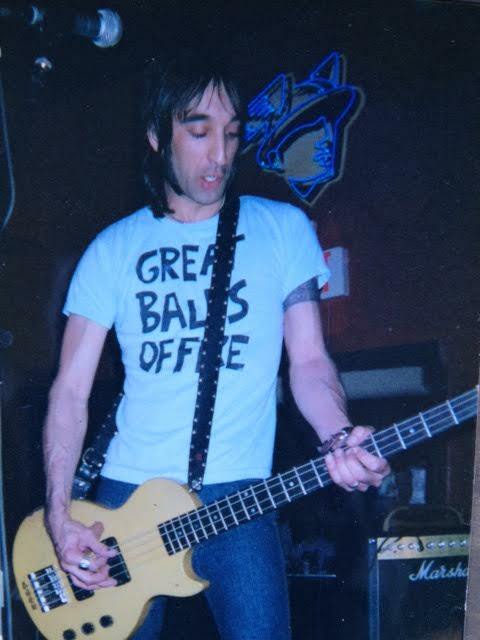 With his hoop earrings, sunglasses, dagger-shaped sideburns and skin-tight jeans, Steve was a string-bean version of Johnny Thunders-meets-Joan Jett with a mullet that rivaled both. Dude had style to spare! Based out of San Diego, The Dragons were regulars in Austin thanks to their religious SXSW appearances. Lead singer Mario Escovedo was also well-connected in Austin due to his brother Alejandro being a local music legend. I was already a fan of The Dragons, but soon found myself becoming fast friends with Steve, Mario, drummer Jarrod Lucas and guitarist Kenny Mochikoshi-Horne. I never missed them when they arrived, their broken-down van be damned. R.L.F. : A photo I shot of Steve closing out SXSW with The Dragons at the Continental Club in Austin. The music, of course, was my first attraction. When it comes to barroom, sing-along, whoa-yeah, rock-n-roll, few bands have done it better than The Dragons. Their sound was a contagious cocktail of the New York Dolls, Hanoi Rocks, the Rolling Stones and Jack-and-Cokes (the band’s preferred breakfast, lunch and dinner). They were loved in a gritty circle of underdog rock bands that included the Wildhearts, the Hellacopters, the Streetwalkin’ Cheetahs and the Riverboat Gamblers. The Dragons were energetic, they were fun, they had smiles for miles and, to paraphrase the title of their 1999 album, they simply rocked like f*ck! As I interviewed the band over a meal of Mexican food, Steve told me his day job was at TUK Shoes, a business that specialized in creepers and Vans-like footwear. When he asked me for my shoe size, I dismissed it as a casual inquiry since we were on the subject of sneakers and other such stuff. Two weeks later, two boxes of brand-new shoes arrived on my doorstep courtesy of Steve and TUK Shoes. When I wrote to tell him one pair didn’t fit (I wanted to return it so TUK didn’t lose a potential sale), he told me how to go about returning it and sent another pair as a replacement. All this without me ever asking for a thing. Steve just did it! That’s how cool he was. 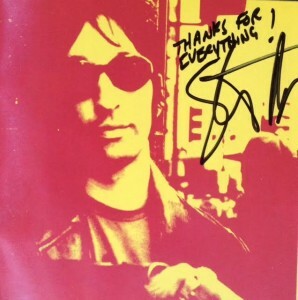 SPECIAL THANKS: The pleasure was mine, Steve. The Dragons called it quits in 2005 after a 13-year run that produced such masterful garage-rock albums as “Pain Killer,” “R.L.F.,” “Rock-n-Roll Kamikaze” (the gem of the bunch in my opinion), “Sin Salvation” and “Live at the Casbah” (the Dragons’ beloved hometown dive bar). Trust me, you owe it to yourself to own at least one. At this writing, I’m still not sure what happened to Steve. Reports indicate he suddenly became ill last weekend and passed at age 48 on Tuesday, July 21, 2015. He was 13 days younger than me. Steve is survived by his wife Jamie and 15-year-old son Jesse. Details for Jesse’s fundraiser are here if you’d like to help. I’ll miss you, Steve. I haven’t seen you in a while, but your smile and warmth will always be with me. You were one stylish cat and the sweetest of souls. Thanks for lighting up my life with your music and friendship. You truly were special, mi amigo! The clip below cuts off at 1:45, but gives you a perfect taste of The Dragons’ sound and vibe. Below that is a moving tribute, courtesy of Mario Escovedo. We all share in your loss, Mario. Peace, my friend. Thank you for sharing this with everyone! Steve had a smile that would light up any room he was in, a kind word for everyone he met, and a heart of gold!! His music will live on, as will the memories of him that we all carry in our hearts and thoughts. . He will never be forgotten! Rest in peace, Steve. . .
Couldn’t agree more, Penny. Thanks for reading. Thank you for making a mom proud! he was a great guy and it makes me feel so good to hear it from so many people. I wish I could have met more of his friends, you are all so fantastic. my heart is broken. Michelle!! Great to hear from you. Thanks for reading and posting. And yes, the Dragons were a special band of great individuals. Lots of great memories, including multiple SXSW gigs. Was always good to see you!